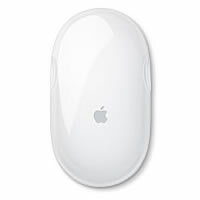 Using Bluetooth wireless technology the Apple Wireless Mouse provides a reliable, secure connection to your Mac with no cable clutter. The sleek, easy-to-use design of the mouse fits most any size hand and is equally comfortable for both right and left handed users. A click tension adjustment accommodates both heavy-handed users as well as those with a light touch. Important: Requires a Bluetooth enabled Macintosh (either built-in or using the qualified D-Link DBT-120 USB Bluetooth Adapter (Hardware version B2 or later. Older D-Link DWB-120M adapters are not supported). Mac OS X, v10.2.6 or higher required.